At 9 years old, Presleigh Olson-Buehler is already an accomplished artist and entrepreneur. 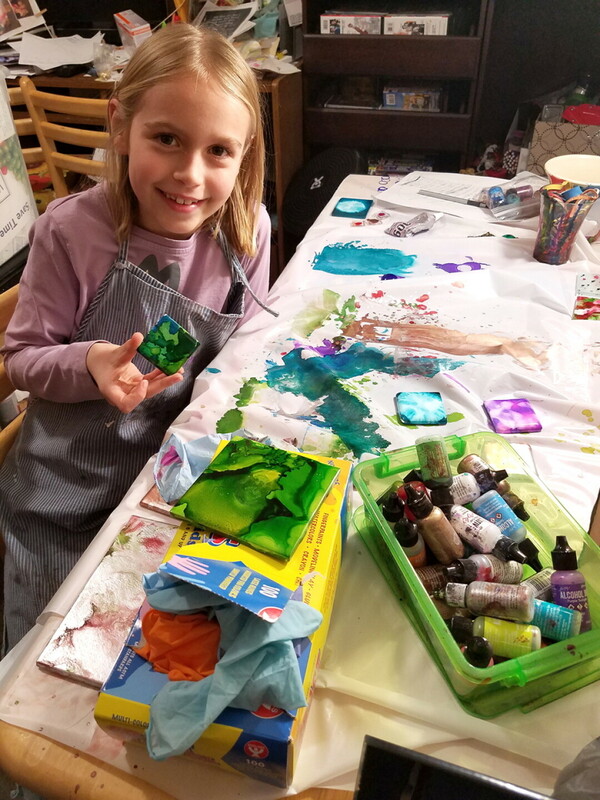 She recently started selling her artwork at Tangled Up in Hue in downtown Eau Claire, and so far, she is the youngest artist to do so. Presleigh has always been artistically inclined. Every since she was little, she has dreamed of owning an art store. At one point, Presleigh was homeschooled and devoted several hours every day to art projects. Toni, Presleigh’s mom, saw the need for art enrichment, and asked a family friend to provide Presleigh with art instruction. Presleigh was exposed to four or five different mediums, but when it came to alcohol inks, something clicked. 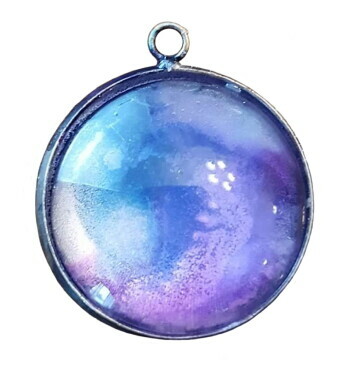 When asked to describe these special inks, Presleigh says the rubbing alcohol makes the inks more “liquidy.” Alcohol inks are rich in color and blend easily, producing a marbling effect – think the Northern Lights at their peak. She paints with both regular brushes and special alcohol ink brushes on ceramic tile. At times, she will use a drinking straw to blow air onto the inks, creating the shapes she wants. After the painted tiles air dry, she sprays them with a fixative. A couple of months ago, Presleigh became serious about selling her artwork. Toni was acquainted with the owner of Tangled up in Hue, 505 S. Barstow St., who met with Presleigh. A business partnership was born, and since November, Presleigh has been among the more than 100 artists whose work is for sale at the store. Prices for her creations range from $4 to $38 for magnets, necklaces, trivets, and wall hangings. Presleigh is a little artist with a big heart, and loves sharing her art with others. She creates handmade books for her younger cousins to read and enjoy. She also has donated her artwork for charity auctions, most recently the Eau Claire County Humane Association. Toni manages a Facebook page, “Imagine Art by Presleigh,” where you can view and keep up to date on Presleigh’s art. With her enthusiasm and talent, big things lie in store for Presleigh. She reminds us that your age should not be a barrier to pursuing your ambitions.